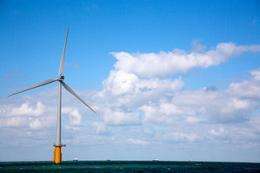 A new Department of Energy research facility could help bring the U.S. closer to generating power from the winds and waters along America's coasts and help alleviate a major hurdle for offshore wind and ocean power development. Will Shaw, an atmospheric scientist at DOE's Pacific Northwest National Laboratory, will describe plans for the facility at an 11:45 a.m. talk today at the 93rd American Meteorological Society Annual Meeting, which runs through Thursday in Austin, Texas. The Reference Facility for Offshore Renewable Energy will be used to test new technologies designed to determine the power-generating potential at sites along U.S. shores. Research at the facility will help verify that the technologies can collect reliable data and help improve those technologies. This knowledge provides potential investors confidence when reviewing offshore development proposals. Questions about the accuracy of offshore data from new measurement technologies have made some investors hesitant to back offshore energy projects. Current plans are for the facility to be located at the Chesapeake Light Tower, a former Coast Guard lighthouse that is about 13 miles off the coast of Virginia Beach, Va. Scientists representing industry, government and academia are likely to start research at the facility in 2015. Pacific Northwest National Laboratory will shape and prioritize the research conducted there, while National Renewable Energy Laboratory will manage the facility's remodeling and operations. PNNL will form an interagency steering committee to determine the facility's research priorities and procedures. Research will primarily focus on offshore wind, but will also include underwater ocean energy and environmental monitoring technologies. Part of NREL's renovation of the former lighthouse will include installing research equipment. Such equipment includes a meteorological tower that reaches 100 meters above sea level, which is the height of offshore wind turbine hubs. The harsh environment and remote locale of offshore energy sites makes new technologies necessary to assess the power-producing potential of offshore sites. Strong winds and high concentrations of salt, for example, mean data-collecting equipment needs to be heavy duty and extremely sturdy to operate offshore. And while land-based wind assessment is often done by placing meteorological equipment on a tower, the challenges of anchoring similar towers into the ocean floor can increase costs substantially. As a result, offshore energy developers are looking at new ways to gather precise wind measurements at sites of interest. Among the new technologies that are expected to be tested at the reference facility are devices incorporating LIDAR, also known as light detection and ranging, to measure offshore wind speeds. With these instruments, researchers measure wind strength and direction by emitting light and then observing when and how some of that light is reflected off of tiny bits of dust or other particles blowing in the breeze. LIDAR devices for offshore wind measurement would be placed on buoys in the ocean. However, ocean waves move buoys up and down, which would also send the device's light beams in multiple directions. So scientists have developed methods to account for a buoy's frequently changing position to collect the wind data they need. That's where the reference facility comes in. Mathematically corrected data from buoy-based LIDAR is a new ballgame for the wind energy industry. To prove that the data they collect are both reliable and accurate, wind assessment LIDAR devices would be placed both on buoys floating near the facility and also on the facility itself. Wind data would be collected from both sources and evaluated to determine the buoy-based technology's accuracy. Fracking. Drill here, drill now. Break the back of OPEC. Exactly how will "Fracking. Drill here, drill now." break the back of OPEC? And even if your nefarious plan is successfully implemented, how exactly does it solve the multifaceted problem of fossil fuel derived energy? The back of OPEC has already been broken. Canada and Venezuela are not members and will likely never be members. Capitalism Prevails again.